Bulgarian Air Force MiG-29 fighter pilots at Graf Ignatievo air base again did not take off for scheduled training exercises on October 25 – but whether this was because of poor weather conditions or because they again felt “psychologically unable” to fly was unclear, Bulgarian National Radio said. Authorities continued to insist that there was no mutiny at the air base, a day after it emerged that most of the pilots had refused to take to the air for the training flights. On October 24, the exercises were reported to have been suspended, apparently because pilots had safety concerns and were frustrated by the latest delay in acquiring new fighter aircraft. On October 25, the Prosecutor’s Office in Plovdiv said that it had investigated at the request of the Military Police regional office in the city and found no crime had been committed. Personnel at the air base were performing their tasks and there was “no evidence” of them refusing to do so, a statement said. Nor was there evidence of a mutiny by pilots and ground crew, it said. Former defence minister Nikolai Nenchev called on current Defence Minister Krassimir Karakachanov to investigate what was going on at the air base. Nenchev said that someone “in a very high place” was inciting the pilots. He said in a television interview that it was very worrying that service personnel were not carrying out their duties. Nenchev urged an immediate investigation by the Military Police, State Agency for National Security and intelligence services, because the situation could avalanche and lead to other protests. In defence structures, this would be dangerous. For people to embark on a protest like this meant that they thought that they had support at a very high level, Nenchev said. At the beginning of the sitting of Bulgaria’s National Assembly on October 25, the opposition Bulgarian Socialist Party called for Defence Minister Karakachanov to be asked to come to the House to address Parliament on the situation at Graf Ignatievo. The proposal was rejected, with 79 votes against, 48 in favour and 62 abstentions. Bulgarian National Television said on October 25 that, following the suspension of the training flights the day before, talks were being held on Wednesday between the military base’s commanders and the flight crews. 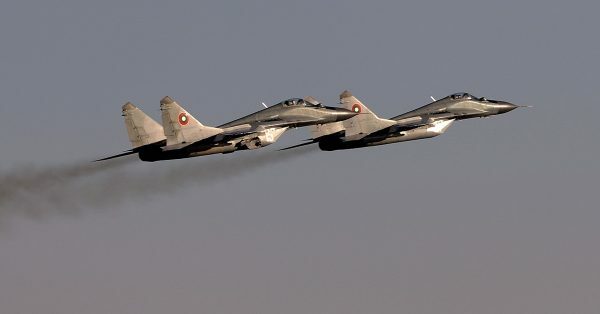 According to BNT, the flights on October 25 did not go ahead for the same reasons as the day before – the pilots do not feel safe flying the old MiG-29s. A Bulgarian air force Mikoyan MiG-29 Fulcrum fighter aircraft assigned to the 3rd Air Force Base flies over the flightline during joint Nato air policing at Graf Ignatievo, Bulgaria, September 8 2016. US Air Force photo by Staff Sergeant Joe W. McFadden. “They have been informed of the decisions taken by the Defence Ministry and the military command to resolve the problem, but they remain on the ground today,” BNT reported. On October 24, Deputy Defence Minister Atanas Zapryanov said that the pilots lacked confidence to take to the air because of insufficient training and insufficient flyiing hours. 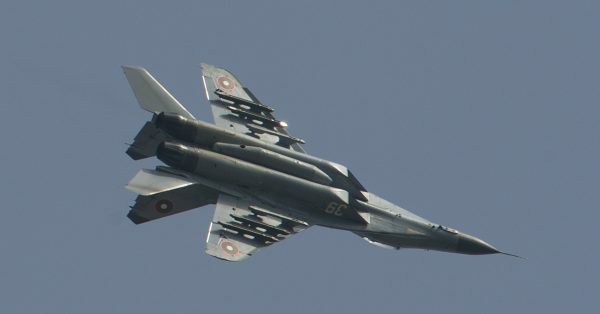 He emphasised that the ministry was doing everything possible to keep the MiG-29s airworthy, to allow normal training activities and continued policing of Bulgarian air space. Zapryanov said that Russian company RSK MiG had delivered 10 engines for the Russian-made aircraft, including six new ones and four that had been overhauled. However, procedure did not allow the engines to be put into use, because the accompanying documentation was copies, not originals. He said that it was expected that the Russian company would confirm the authenticity of the documentation within 10 days, enabling the engines to go into use. As to concerns about fuel, Zapryanov said that the Defence Council had made available a further 20 million leva (about 10 million euro) for jet fuel, and this would cover fuel until October 2018. All reports from the air base are that while training flights were not going ahead, air policing is proceeding as scheduled. Until October 31, the Italian Air Force is assisting in guarding Bulgarian air space, in a joint mission with the Bulgarian Air Force.